When I first looked into biodegradable nappies, I was SO confused! What did it mean that a nappy was biodegradable? Do the nappies decompose if I just throw them in the normal bin (or do I need to compost)? Am I paying more money without making a real difference? Hopefully, this will help clarify any questions that you may have, and help you make an informed choice about biodegradable nappies! Something that is "biodegradable" will decompose over time, if there are 3 elements: (1) moisture, (2) heat (between 10-35 degrees Celsius) and (3) bacteria. WILL my nappies "degrade/decompose" if I throw it in my normal bin? Landfills are lined with plastic film to keep the garbage juice from leeching into the soil. This is piped back through the landfill creating moisture (Element 1). Moreover, when organic matter (such as food scraps, garden waste, paper etc) oxidises, it creates heat (Element 2). The bacteria (Element 3) is inherent in garbage, and so you have all the elements you require for organic matter to decompose. So the short answer to this question is YES. And to answer the other question - "Are you wasting your money?" NO. Biodegradable nappies decompose a LOT quicker than generic nappies. Further info: When organic matter decomposes, it releases methane (a greenhouse gas) which is harmful to the environment. That is why it is always best to compost where you can. However, landfill technology has now made it a lot easier for the methane gas to collected and reused as fuel, reducing this negative impact. ARE there any disposable nappies that are 100% biodegradable? At the moment, there are no disposable nappies that are 100% biodegradable. However, there are nappies where parts are biodegradable, which is why you'll see some advertised as "60% biodegradable" or "70% biodegradable". In contrast, Alcmena's nappies are 80% biodegradable. The inner and outer layers of Alcmena nappies are 100% biodegradable. They are made from PLA (PolyLactic Acid)* which is a biodegradable plastic made from natural plant-based materials. Furthermore, our unique super-absorbent layer is made from chlorine-free natural wood pulp, whilst the super soft lining is 100% corn-based non-woven fabric. So while there are aspects of our nappy that are non-degradable (which will change as soon as the technology is available! ), a large portion IS degradable and will decompose over time. *Most disposable nappies that are non-biodegradable ("normal") use PE (Polyethylene) in their nappies, which is the common man-made plastic. 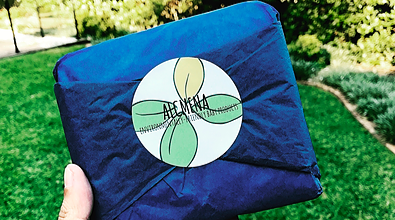 For more information about Alcmena's nappies, download our Introduction Brochure here! Grab a FREE Alcmena Nappy Sample today and discover for yourself the amazing qualities of corn-fibre!